They say your life flashes before your eyes when you die, but what if it was someone else's life instead? Lost Highway—as with most David Lynch films—is a particularly enigmatic film, so if you haven't seen it and have any interest in the film you should probably see it before reading anything. There's a sense in which his films are essentially unspoilable (they're too purposefully ambiguous), but that's not going to stop me from trying. Potential spoilers below. 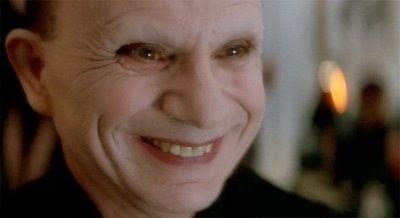 There's an abundance of polyvalent symbolism in Lost Highway, so here's my best effort at boiling all the mystery out of it: Fred Madison is a jealous husband convinced that his wife is cheating on him, so in a fit of rage he kills her. He's given the death sentence, and while in prison he fantasizes a life in which he isn't the impotent, powerless man he feels himself to be—a life in which his wife loves him. But while his fantasy-self is initially irresistible to the women around him, reality slowly creeps in as his relationships fall apart and the jolt of the electric chair sends bolts of lightning into his fantasies. Lost Highway is David Lynch's Vertigo (we even see the love interest as both a blonde and brunette), except that where Hitchcock focused on the way our fantasy of the other structures our desire (Jimmy Stewart doesn't want Kim Novak until she looks the way he imagines her), Lynch shifts the focus to our fantasy of ourselves (Patricia Arquette doesn't want Bill Pullman until he reimagines himself as Balthazar Getty). We're incapable of loving someone else until we learn to love ourselves—or rather, we're incapable of loving someone else until we learn to see ourselves as someone worth loving. Underneath our Balthazar Getty, we're all secretly Bill Pullman. It's also significant to note that we never learn whether or not Bill Pullman's wife was cheating on him. In his fantasy, the Patricia Arquette character is polyamorous, but at that point we've left reality and entered a world distorted by Pullman's character's troubled psychology. 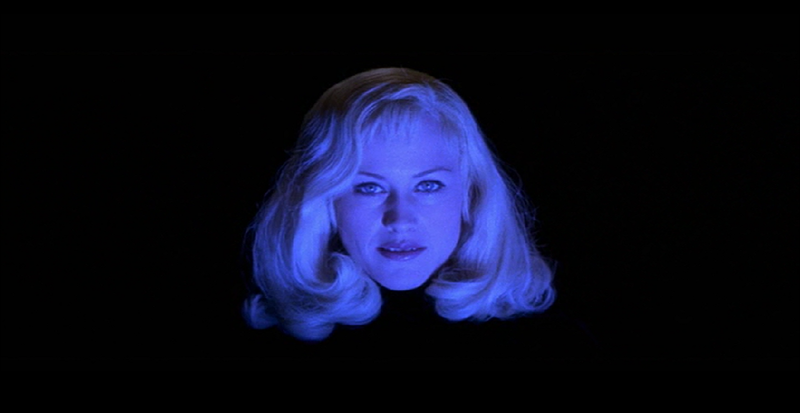 Like Vertigo, Lost Highway examines the ethereal nature of feminine subjectivity. Throughout the film, the male protagonist is trying to pin down Arquette, both when he's powerless as Bill Pullman and when he's irresistible as Balthazar Getty; but just as femininity could not be contained by Madeleine Elster or Judy Barton in Vertigo, neither can it be grounded in Renee Madison or Alice Wakefield in Lost Highway. In the climactic sexual encounter, Arquette whispers to Getty, "You'll never have me! "—female subjectivity is ultimately intangible. Patricia Arquette as a symbol of feminine jouissance. Also, the last time I saw this I hadn't seen any Douglas Sirk movies, and this time it played to me like a Hitchcock thriller directed by an exceptionally inebriated Sirk. It's about a similarly melodramatic relationship, and Lynch uses color and shadow (and even dissolves) in a really similar way, except that everything is pushed to the next level. The introduction of Alice (Blonde Patricia Arquette; one of my favorite scenes in the film) is like Sirk's visual style taken to it's (il)logical extreme. Seeing this projected in 35mm was a blast (thanks Brattle!). The crowd went wild for the tailgating scene. The opening is still too slow for my dumb brain. I think this part of the film is supposed to be a bit dull—we feel the cold lethargy in the relationship, and it helps contrast the energy of the second half—but I can't stop myself from looking forward to the transition to Getty's timeline. This time it was a bit easier to enjoy this first half because the photography is beautiful and looks even better on the big screen. There's a lot to say about Lost Highway and I don't have time to unpack it all, but if you're interested in David Lynch and psychoanalysis I highly recommend The Impossible David Lynch.